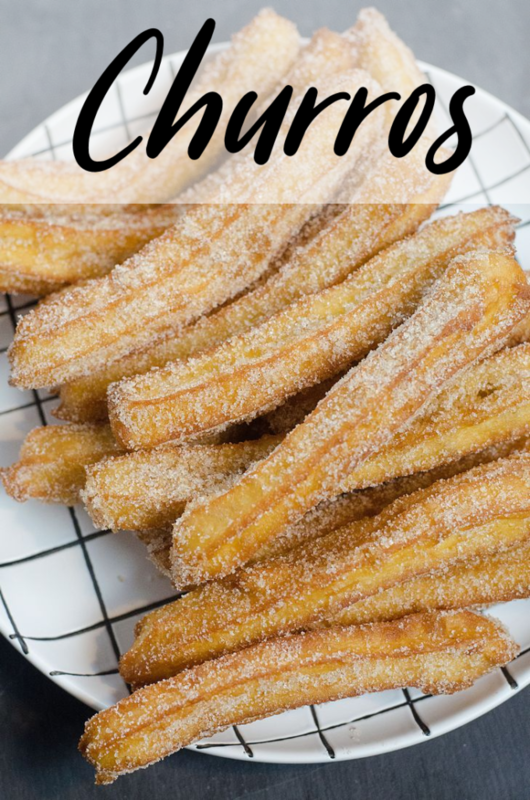 Churros are a light and sweet dessert that isn’t like the desserts coated in chocolate. The cinnamon and sugar coating is a perfect match to the fried dough. 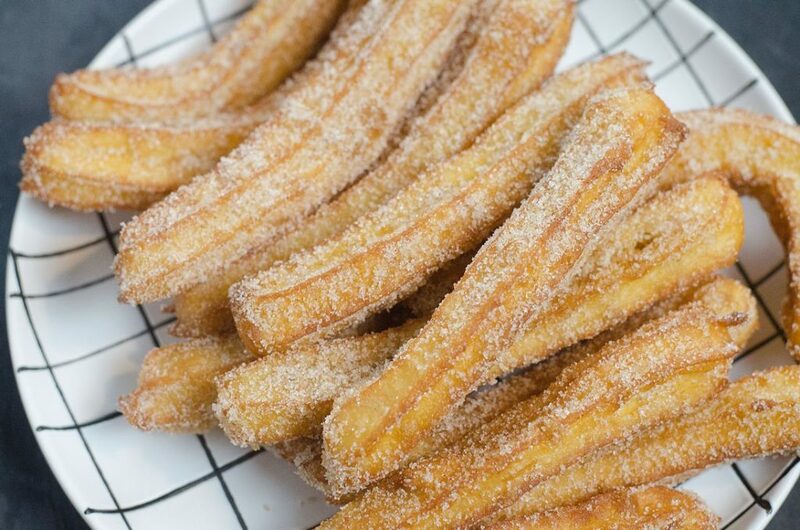 Churros are quite easy to make at home with just a bit of effort. The effort is really the time it takes to fry the churros. Hence, when you make the dough it comes together in very little time. 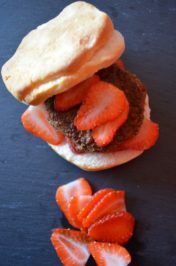 Unlike other doughs that contain yeast and need time to rise. 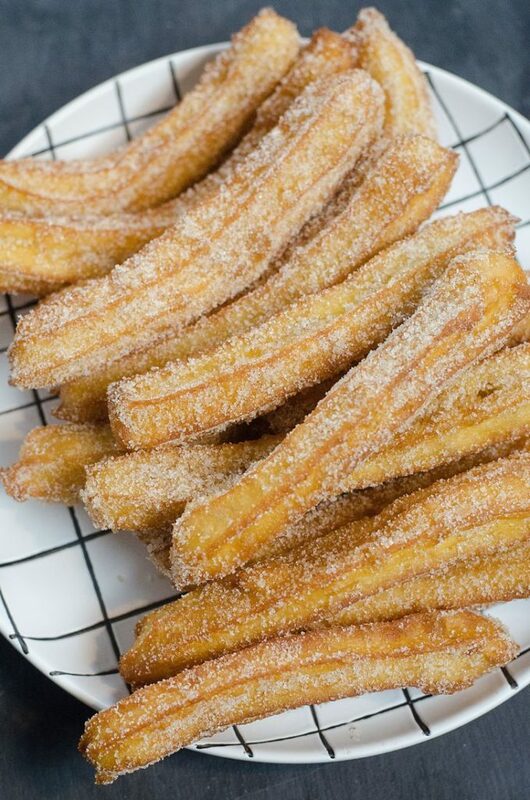 Churro dough doesn’t need yeast. Once the dough is finished the real time is the time it takes to fry the churros. We did this one evening after dinner. 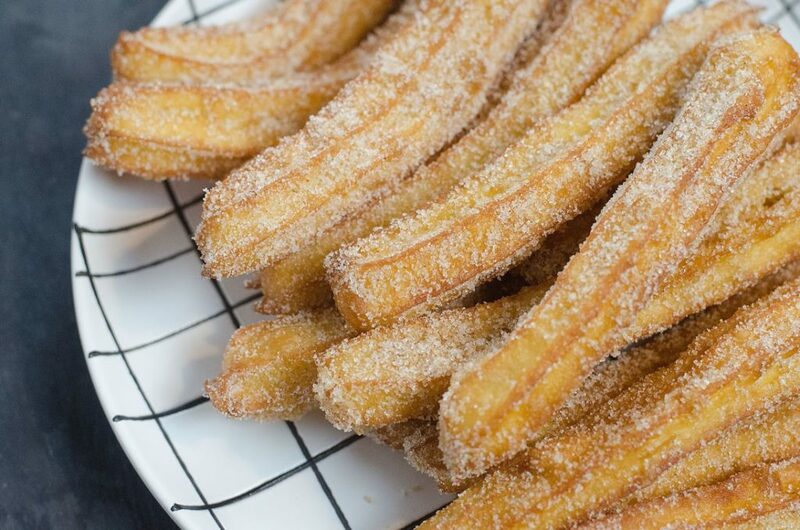 The first trick to getting the churros perfect is using a deep fry thermometer. 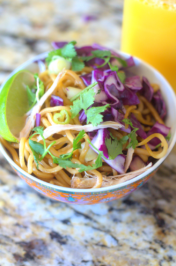 Therefore, I highly suggest you have a deep fry thermometer when making this recipe. Once the thermometer is set in place heat the oil to the right temperature. Secondly, make sure you have a good size star tip that allows the dough to move freely through it. This helps create the beautiful shape of the churro. However, any tip can be used but won’t create the same effect. Third, the knife you use to cut off the dough as you pipe it into the hot oil needs to be sharp. This knife will be placed at the end of the piping bag near the tip and at a angle cut swiftly against the dough. Hence, the dough will drop into the oil. 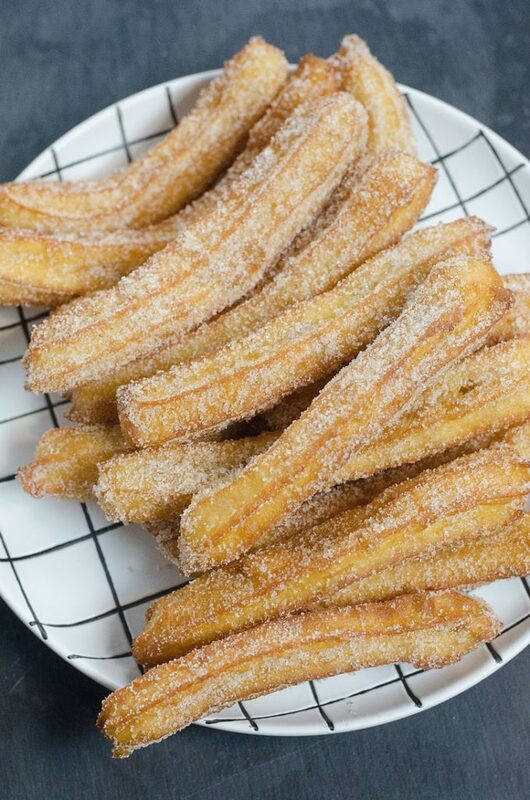 Therefore, if you cut the dough quickly enough the churro won’t curl. If you cut to slow the churro will curl in the hot oil. After frying for about 2 minutes per side until lightly brown remove from the oil with a spider. 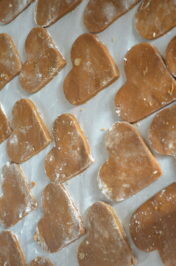 Place into a bowl with cinnamon and sugar then toss well. Remove to a wire rack which this step is very important. This allows the dough to dry out nicely and not get soggy. 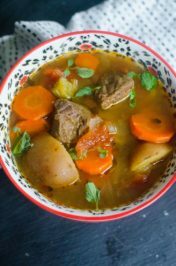 Serve while warm for the best flavor. Nicely fried dough coated in sugar and cinnamon to make Churros. Using a stand mixer fitted with the paddle attachment on medium-low speed, add eggs to dough, one at a time, making sure to incorporate each egg before adding the next. Make sure to scrap sides of the bowl to be sure everything incorporates into the dough. Dough will come together and be easy to spoon into a piping bag. Spoon dough into prepared piping bag. 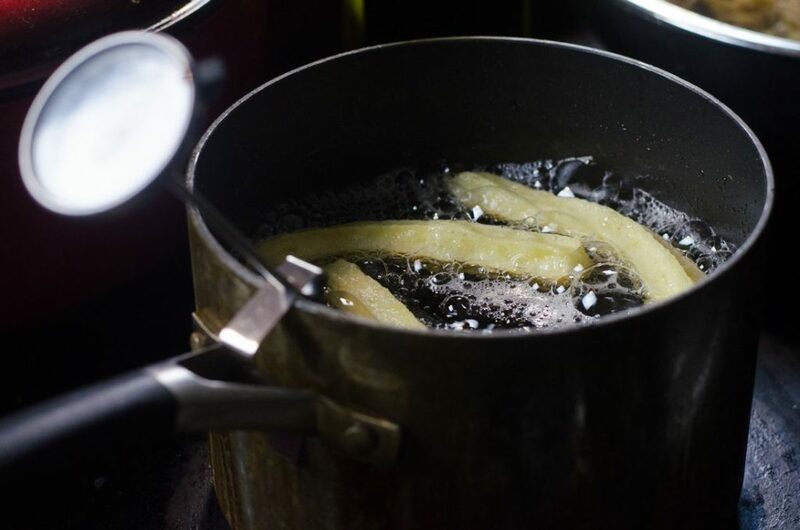 Pour vegetable oil into a small sauce pot to come halfway up the sides. 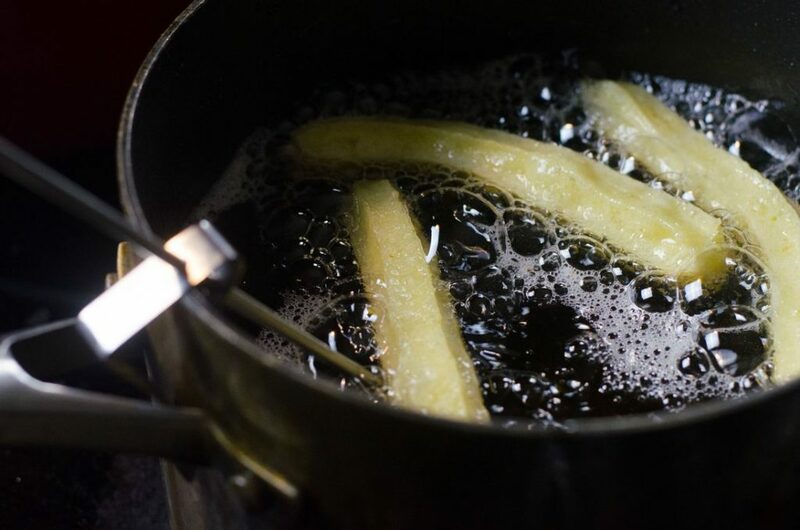 Using a deep fry thermometer bring oil to 350 degrees F. Pipe out about 4 to 5 inches of dough and cut off with a knife quickly. Fry up to three at a time like this. Cook for 2 minutes each side until lightly golden brown. Remove to bowl with sugar, organic sugar, and cinnamon. Toss and place on cooling rack.